NASA’s Airborne Tropical Tropopause Experiment (ATTREX) mission began its fifth and final year of flights on March 4. 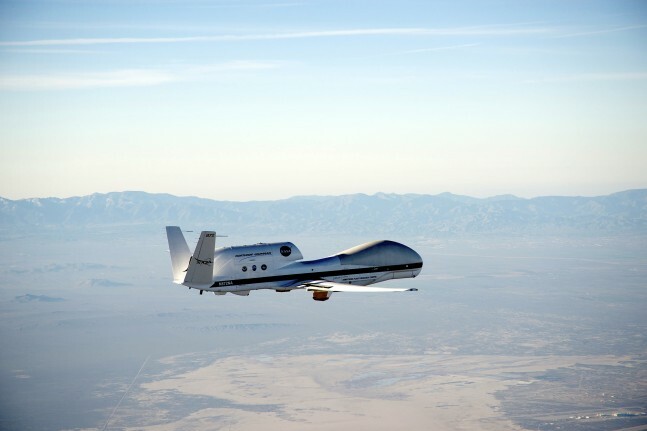 The remotely piloted Global Hawk research aircraft took off from NASA’s Armstrong Flight Research Center in Edwards, California, to track water vapor into the upper atmosphere and help scientists understand how greenhouse gases impact Earth’s climate. The NASA ATTREX mission is collaborating with scientists from the United Kingdom (UK) to execute their Coordinated Airborne Studies in the Tropics (CAST) project, which is funded by the UK’s Natural Environment Research Council (NERC). The mission will continue to focus on the transport and exchange of greenhouse gases, particularly water vapor, in the tropical tropopause region, the transitional layer between the lowest part of the atmosphere, known as the troposphere, and the layer above it, the stratosphere. Scientific instruments aboard the Global Hawk include a subset of the ATTREX payload that was previously flown, with a focus on water vapor and cloud measurements. Additionally, two new CAST instruments will be included: the Aerosol Ice Interface Transition Spectrometer (AIITS) and the GreenHouse gas Observations in the Stratosphere and Troposphere (GHOST). “The combination of ATTREX and CAST instruments will provide new information about the formation of tropical tropopause layer cirrus and the shapes of the ice crystals that comprise them,” said Eric Jensen, the ATTREX principal investigator at NASA’s Ames Research Center at Moffett Field, Calif. “The cirrus ice crystal sizes and shapes determine how fast they fall and remove water vapor from air rising into the stratosphere. Previous research has shown that even a small amount of water vapor in the stratosphere can warm the surface temperature by trapping heat rising from the surface. The tropical tropopause is considered by scientists to be the gateway for transport of water vapor, ozone, and other gases into the stratosphere. For the ATTREX mission, the Global Hawk will be flying over the Pacific Ocean, near the equator and within the tropical tropopause region (altitudes of 45,000 to 60,ooo feet; 13,700 to 18,300 meters). The AIITS experiment was developed by the Universities of Hertfordshire and Manchester, both in the UK. AIITS will measure the the scattering properties of aerosols and cirrus clouds, providing data about the shape and composition of particles. Neil Humpage, an investigator from University of Leicester, services the GHOST instrument with cryogenic liquid to keep it cool and functioning properly during flight. Researchers expect that these measurements combined with those of the ATTREX Hawkeye, a cloud particle probe managed by Stratton Park Engineering Inc. (SPEC), and water vapor instruments will provide important new information on the formation and impact of extensive, thin cirrus clouds in the tropical tropopause layer. The GHOST instrument was developed by the UK Astronomy Technology Centre in Edinburgh and the Universities of Edinburg and Leicester. GHOST will measure columns of greenhouse gases, including carbon dioxide, methane, carbon monoxide and water, below the Global Hawk’s path. It is a compact Short-Wave Infrared (SWIR) spectrometer that is similar to the instrument aboard the NASA Orbiting Carbon Observatory (OCO-2) satellite launched in 2014. GHOST will provide high spatial-resolution data about the greenhouse gases and validate the satellite instrument. ATTREX will conduct three flights of 22 hours for a total flight time of 66 hours. This year’s flights will bring the total number of hours flown for ATTREX to about 390 hours since 2011.